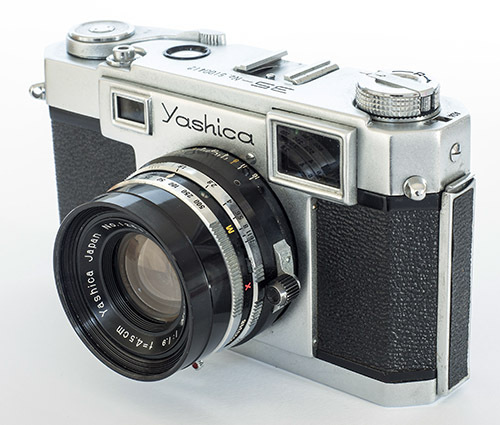 The Yashica 35 was Yashima's first 35 mm camera and the second camera after its Yashica 8 movie camera to tread a different path to its bread and butter 6x6 TLR models which had so far been the source of the company's growth and success. The writing was on the wall for TLRs and Yashima could see that the future looked different. How this camera was developed is not clear to me. It is often linked to the acquisition of Nicca (May 1958). 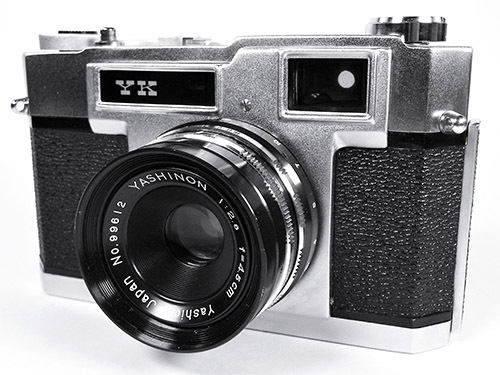 The Yashica rangefinder camera website Yashica Guy, comments that it “ is the first of the Rangefinder models to have been produced in the integrated Yashica Works”. In one sense, that is likely to be correct but in another, it gives a false impression that Nicca was somehow involved. 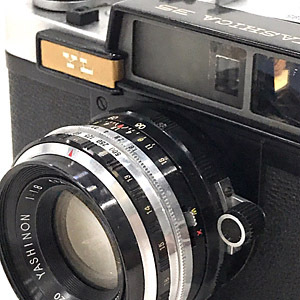 From serial numbers, it looks like the first production examples rolled off the assembly line in April 1958 already which fits with the April 1958 release claimed by Japanese magazine “Camera Collectors' News” of July 1987 and other sources. In other words, Yashima was already making this camera before the arrangement with Nicca came into effect. 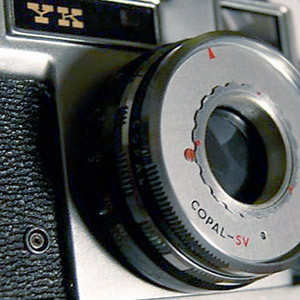 Although lacking innovation in comparison to some contemporary models, most commentators regard the Yashica 35 as a well designed, quality camera. To me, it seems like the mature product of a camera maker familiar with 35 mm fixed lens rangefinder cameras so it is quite remarkable for a first up effort, particularly in light of Yashica Guy's claim that the General Manager of the “reorganised company”, Mr Agucho, had a vision of a rangefinder camera “which the masses could afford”. Clearly, the design, testing and tooling for such a model will have taken some time to execute and its gestation must have occurred well back in 1957, if not earlier. 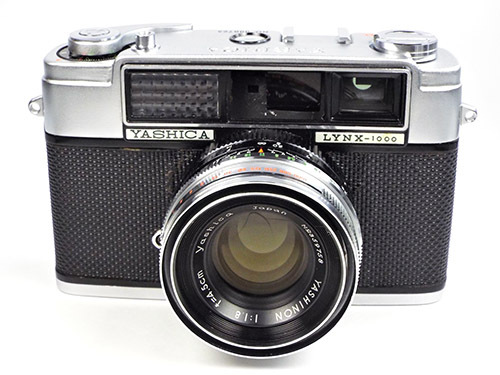 If Yashica had any sort of outside assistance or partnership in the development, it would unlikely have been struggling Nicca as its models had little in common with a rangefinder camera with fixed lens and in-lens leaf shutter. 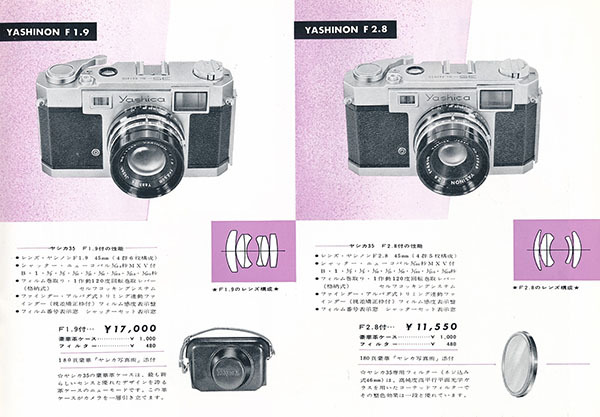 Given Yashima's established focus on quality at the lowest prices (profit through volume) and the vision of this camera as being for the “masses”, Yashima could have been forgiven for some cost cutting with this first model but there is little evidence of that. 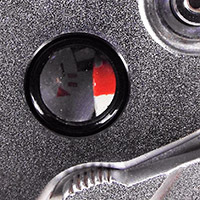 The coupled rangefinder has a long base and uses superior prisms instead of mirrors. 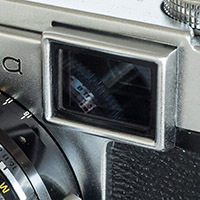 The combined viewfinder/rangefinder window is not parallax corrected but does have a bright frame, already an improvement over most of the more expensive Leica copies available. 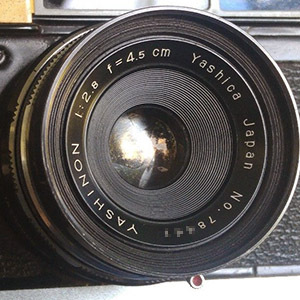 Frame counting is in a window and resets automatically, not even something carried across into Yashica's first SLRs. 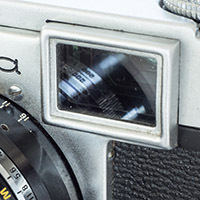 The top plate also has a window for setting the DIN/ASA film speed reminder. The between the lens leaf shutter has a full range of speeds from B to 1/500, in most instances using the old speed progression (e.g. 1/25 and 1/50), and also a self-timer. Three examples have been found with the new progression (e.g. 1/30 and 1/60). One is the last f/1.9 version in my database (the SV example from December 1960 immediately below) which makes sense, the other two are f/2.8 versions from much earlier, December 1958 and January 1959. With its TLRs, Yashica seemed to start the transition from the old progression in 1958 but there were still some stragglers in early 1961. 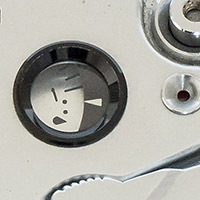 With the shutter open on Bulb, the aperture with 10 curved blades is visible which is typical of the Copal MXV and earlier shutters used on Yashica's TLRs. 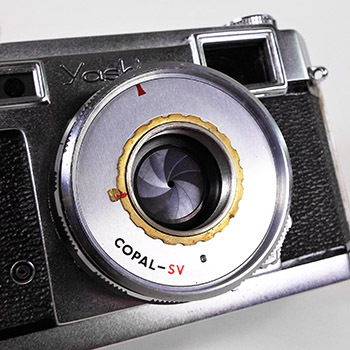 The SV shutters used on Yashica TLRs typically have 5 blades but I'm certain that is not a design absolute, just an optional variation offered by Copal. The two shutters, when configured the same, really are very similar, operate the same way and seem to share parts - see Lenses & Shutters. 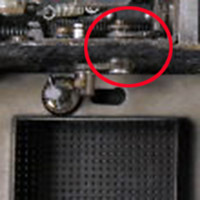 Whether these two examples fitted with Copal SV shutters are repair items, part of a larger implementation of the SV shutter or something else, I really have no idea, but if pressed, I would say it's a supply issue and substituting like with like as far as the shutter and camera maker are concerned. That page is taken from this brochure, there are also similar details in a slightly later brochure in which Yashica tells us that both lenses include elements with glass containing lanthanum, a so-called “rare earth”. Lanthanum is often erroneously thought to be radioactive, well it is but at negligible levels, the lenses that do give off measurable radiation and turn yellow contain thorium. 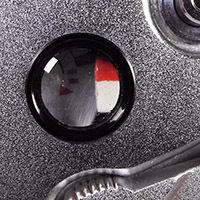 Yashica explains that the lens designs and coatings are focused on obtaining optimum results with colour film noting particular concerns about correcting chromatic aberrations and reducing vignetting (light fall-off towards image edges) given the limited exposure latitude of the emulsions of the day. With Zunow cine lens examples and the 13.5 cm LTM telephoto for the YE & YF almost certainly being made by Kyoei Optical Co., Ltd., the idea of Tomioka being the “exclusive” lens maker for Yashica is somewhat discredited. So who made these lenses? I think that Tomioka has to be the front runner. Whereas with the other lens formats, there was no history of prior examples, similar focal length and aperture “Tominor” lenses (renamed “Tominon” on some later variants) are found on Royal rangefinder cameras made by Royal Camera Company from 1955 onward. The lens construction of the 45 mm f/1.9 and f/2.8 lenses is not known to me but the earliest model featured an unusually complex 50 mm f/2 lens with 7 elements in 5 groups, or, an f/2.8 lens with 5 elements. There may be other Tomioka made examples as well. Camera-wiki.org claims that the 5 element “Riken Ricoh” 45 mm f/2.8 lens of the 1957 Ricoh 500 rangefinder camera was made by Tomioka as was the similar spec “Ricomat” of the 1958 second version. 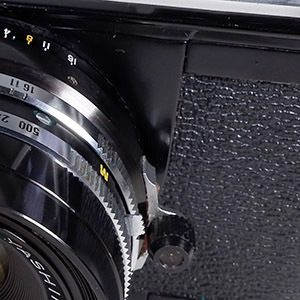 There are other suggestions that Tomioka may also have been responsible for the “Canter” and “Biokor” lenses on Beauty cameras including a pair of 45 mm f/1.9 and f/2.8 lenses for 35 mm rangefinder cameras. With lens barrels that pretty much look identical to each other, you would expect the focusing distance scales to be the same too, but no. 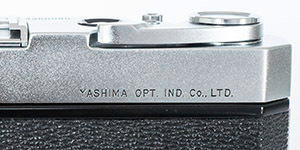 Right from the beginning, whether “Yasinon” or “Yashinon”, Yashima made or Yashica made, the f/1.9 lenses are marked either “M” or “ft” for metres and feet respectively. On the other hand, the f/2.8 lenses on the early Yashima made examples are mainly in feet marked “ft”. There is one metric one marked “Meter”. Then when the maker name changed to Yashica, all bar three in my database are now metric, still marked “Meter”, but the three feet scaled exceptions have changed to “feet”. Dual scale focusing scales, marked “m” (white) and “ft” (yellow), started in November 1959 for the f/1.9 version and early 1960 for the f/2.8 (March by my database but I have no January or February cameras) but the odd single scale camera turns up right to the very end including the very last one in the database (another “ft” from Japan). It's difficult to draw any real conclusions about export patterns, but it may just be that I don't have enough examples, or probably more accurately, a disproportionate number of my examples are from Japanese websites. Even both my very early and late f/1.9 examples have distance scales in feet marked “ft” but were bought from Japan. Unfortunately, there is little in the way of advertising/marketing to help apart from the early Japanese brochures. 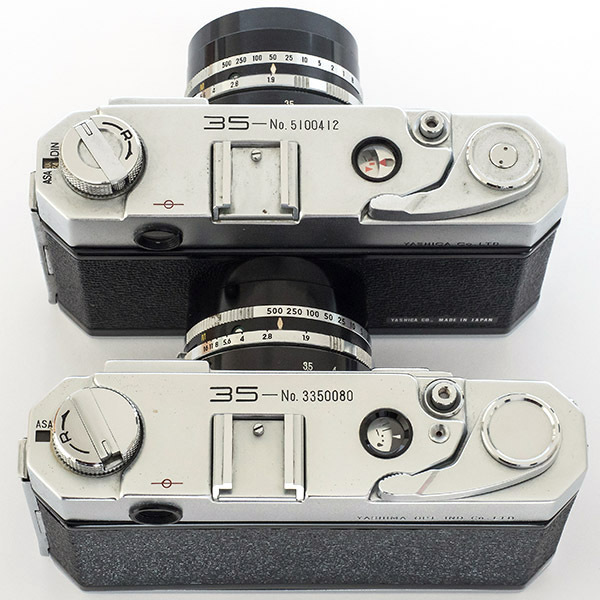 For the domestic market, these refer to a 180 page book with “Yashica 35” in English on the cover which is described as a complete photography guide, much like the Yashicaflex Photography type books supplied with Japanese market TLRs. Although the only ad from outside of Japan that I have found is in The Singapore Free Press newspaper of 27 January 1960 for the f/1.9 model, there was clearly a wider export program. A YouTube video reviewer featuring a Yashica 35, probably from Australia, tells us that the camera belonged to his mother from before her marriage to his photographer father. It is boxed, cased and includes the original English language user manual. From time to time, other Yashica 35 examples do turn up for sale here and I can't honestly say that I have spent much time looking on eBay in the US or elsewhere. Originally, I wasn't going to address Yashica 35 serial numbers because these, more than any other model, stretch credulity to the limit. 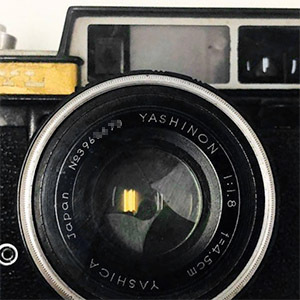 However, there are several sources for the release date and change of maker name from Yashima to Yashica and I am pretty confident about the end date. These put hard markers on the timeline and as the next section will demonstrate, there are far more trim variations than might be imagined. Cameras with the same trim obviously fit in a similar area on the timeline and the evolution of the model becomes self-evident. I can reasonably confidently say that there is no apparent conflict between the serial numbers, as I understand them, and the camera's evolutionary development. As with most Yashima/Yashica models from September 1957 onward and all models from late 1958 onward, Yashica 35 body serial numbers include a date code prefix (TLR-like in this case) followed by a 4 digit sequence number which counts monthly production from 1 to 9,999 (as for the TLRs but for some models counts production from beginning to end). Particularly in the beginning, Yashima chopped and changed its year code between the western calendar, Japanese Showa years and a combination of the two (see Serial Numbers). There is a big problem though and that is the “59xxxx” and “510xxxx” numbers that seem to fit in between numbers starting with “48” and “411”, 1959 August and 1959 November. The “5” could come from Showa 35 making it 1960 but there are two problems with that, the trim on the cameras doesn't match a late 1960 date and the Yashica YL has exactly the same problem but its production seems to stop in early 1960 already, both by serial numbers and a claim by Alan R. Corey about a 1993 Yashica/Kyocera marketing department document. I have highlighted the problem serial numbers in grey and at the moment, have no explanation why they fit there except by magic. 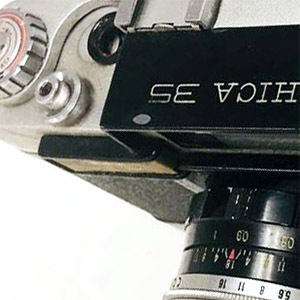 Yashica couldn't have been devious enough to drop the “9” from “59” (1959), could it? 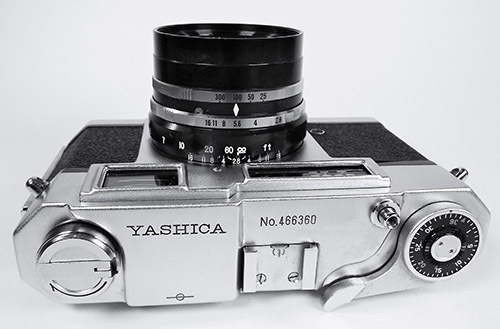 There is no model prefix letter for the October or earlier examples (see Yashica YK below for more examples). The addition of the “F” and “K” prefixes arrived at about the same time that TLRs first got their 2 digit model identifier for the first time (see Serial Numbers from 1957 to 1960, some as early as September 1960). On 1 January 1961, all TLRs started off with their new 7 digit serial numbers preceded by one or two letters, e.g. “D”, “LM” and “ST” and the fourth digit of the year (“1” of 1961) became the year code for the next 19 1/2 years or so. As obviously the YK did with “K 101xxxx”. 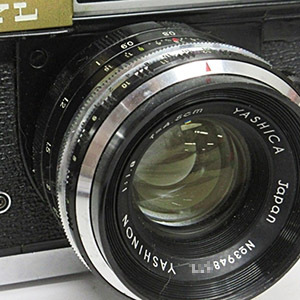 If a Yashica 35 was made in January 1961, its serial number would be F 101xxxx. Many sources claim that production ended in 1960 and one source, Alan R. Corey, claims that a document given to him by Yashica/Kyocera marketing in 1993 shows that the Yashica 35 was made from April 1958 to March 1960 and that the other two rangefinder models without an exposure meter ended production at a similar time (YK in March 1960 and YL in January 1960). My serial number table above suggests that production of found Yashica 35 cameras stopped in December 1960 and that Corey, or Kyocera marketing, was also wrong about the Yashica YK. 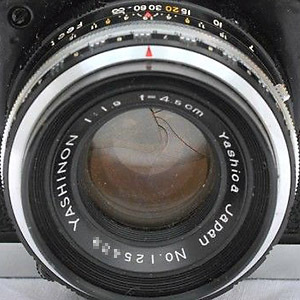 Until nearing the end of production, all the cameras have trim consistent with their serial numbers, with perhaps the exception that f/1.9 “Yasinon” lenses continued to appear from time to time until the beginning of 1960. Then, some late examples in my database have one or more trim items that are from an earlier period, e.g. the last two cameras have the first type focus assist finger grip. Other features on the cameras are appropriately up to date. 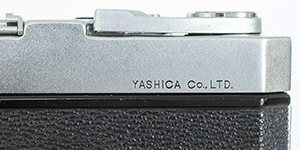 Another couple have the last type top plate engraving “YASHICA CO., LTD. MADE IN JAPAN” but have also reverted to the pre-1959 “MADE IN JAPAN” on the base plate. 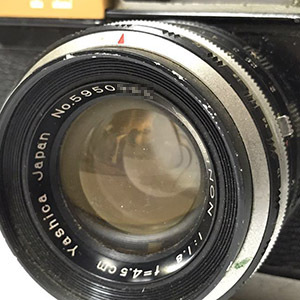 The most extreme example is the only f/2.8 “Yasinon” lens found in the wild. 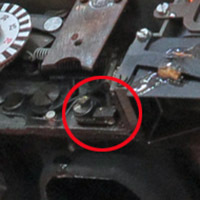 This is mounted on a camera with March 1960 serial number featuring the second type of focus lever in all black which first appeared earlier the same month (the second lever first appeared with black knob on silver support in August 1959, still much later than expected for a “Yasinon” lens). It seems likely that Yashica was using up excess inventory of unused/spare parts. Below is a photo of the top plates of f/1.9 May 1958 (bottom) and October 1959 (top) examples. These are the differences and when they occurred. 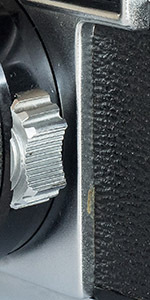 The smooth rewind lever top and film wind lever without central nut with pin spanner holes on the bottom camera only appear in early brochures, on the first f/2.8 example and this very early f/1.9 example. This camera is also the last with an ASA only film speed reminder window. All subsequent examples have a combined scale as on the top camera. 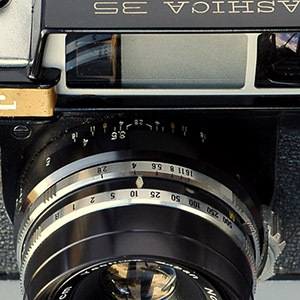 The hole behind the shutter button on the bottom camera disappeared in September 1958. I'm not sure what that is for but inserting a paper clip seems to disengage the counter whilst depressed, perhaps for a double exposure? There is also a fourth type and possibly fifth both of which are quite rare. The first is the iffy one and appears on a March 1960 f/2.8 example and seems to be similar to the one below, only different but that maybe because the counter has reached 36 exposures. The other is on the last Yashica 35 in the database. Rather than a fixed pointer on an attached plate, the whole plate moves to indicate whether the shutter is uncocked (left image) or cocked (right image). The question that comes to my mind is, why? 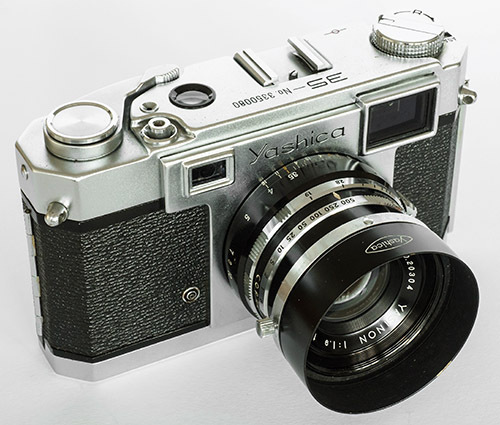 It seems that the Yashica 35 remained in production whilst the next 2 models were released, in fact for most of their lives as well. These are the YK and YL. “K” before “L”, right? 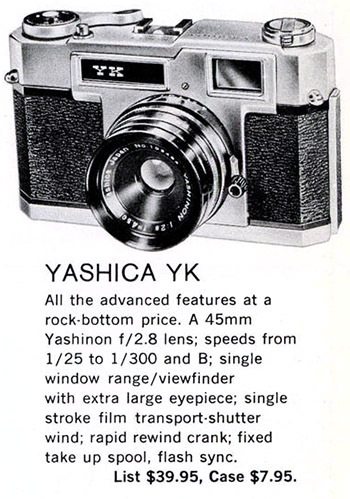 Not according to Japanese “Camera Collectors' News” of July 1987 which claims that the YK went on sale in August 1959 and the YL was released in April 1959. Alan R. Corey's 1993 Yashica/Kyocera marketing document more or less agrees but pushes the YL forward to May. The serial number tables below suggest that production commenced in March for the YL and June for the YK so the claims are pretty much confirmed. Nevertheless, I'll treat the two models alphabetically. 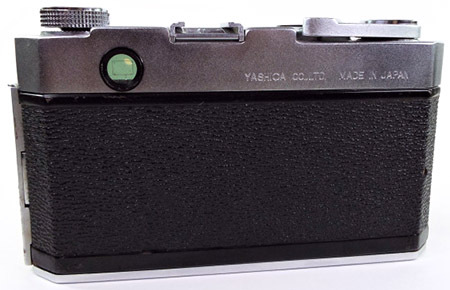 Compared to the Yashica 35, the YK seems to have the same lower part of the body and lens barrel design but the top plate is noticeably taller due to the higher placement of the viewfinder in the body. The reason for this is that on the 35, the rangefinder and viewfinder components are mounted separately to the upper body platform whereas on the YK, as also on the YL and following models, the rangefinder/viewfinder is a complete modular unit which is bolted on top of the platform. This no doubt simplified production. 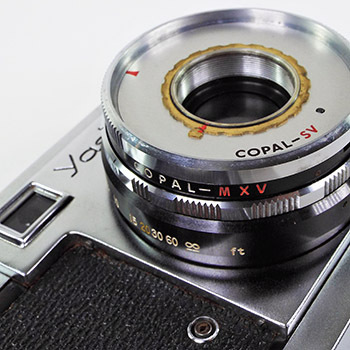 The Copal MXV shutter has been replaced by a simpler Copal type (“Copal” on the barrel, just visible, but the internal cover plate says “Copal SV”, this version of the SV is half empty under the cover). Consequently, the self-timer is gone and shutter speeds reduced to B and 1/25 to 1/300 (like the budget Yashica A TLR). Only the one lens was available, an f/2.8 4.5 cm. The well known website, www.collection-appareils.fr, suggests that the lens is 4 elements in 3 groups, i.e. probably a Tessar, which is still a solid choice and wouldn't surprise me, and this Japanese website, www.asahi-net.or.jp, and Japanese Wikipedia claim the same. The following are the serial number schema of found examples. This is based on a relatively small sample of only 30 cameras so there are likely to be more months of production, although with the Yashica 35 and Yashica YL in production at the same time, there would have been competition for production line space on one hand and danger of over-production on the other with 3 similar f/2.8 cameras vying for consumers' attention. Note: The numbering system starting with January 1961 is the same as with TLRs which remained in place until 1980. 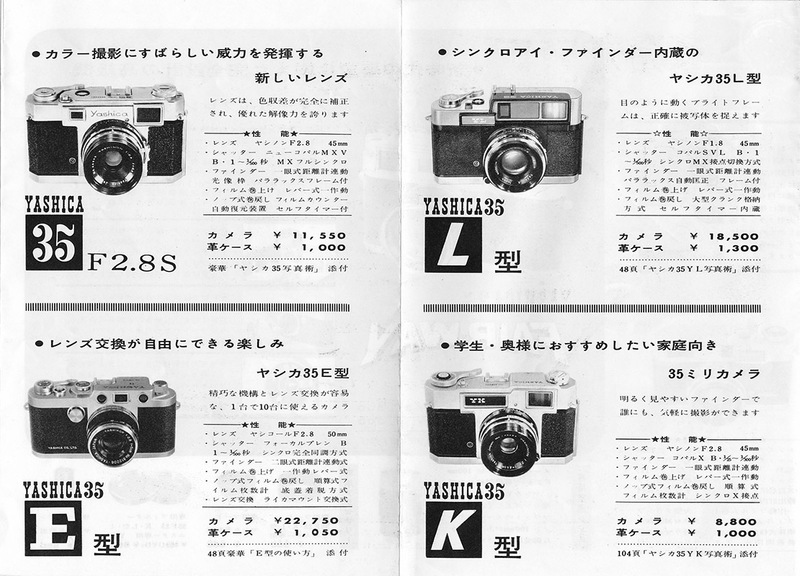 The YK started off with a label on the camera back leatherette with the words “YASHICA CO., MADE IN JAPAN”. Between August and October 1959, this was simplified to “MADE IN JAPAN”. 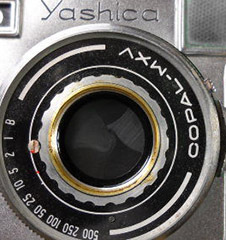 Although the labels were the same as found on the mid/later Yashica 35 examples, in neither case was the maker name engraved on the top plate as on the Yashica 35. 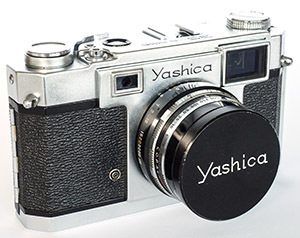 This changed in January 1960 when the label was replaced by first “YASHICA Co., LTD. MADE IN JAPAN” and then later in the same month “YASHICA CO., LTD. MADE IN JAPAN” (the “Co.” became “CO.”) engraved into the back of the top plate making both models the same. Two random cameras in the middle are without labels and top plate engravings but have “MADE IN JAPAN” on the base plate like the earlier Yashica 35 examples - Yashica using up parts? 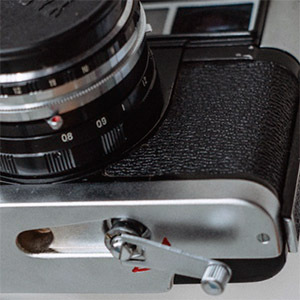 Between January and June 1960, the focusing assist lever changed to all black (same style). 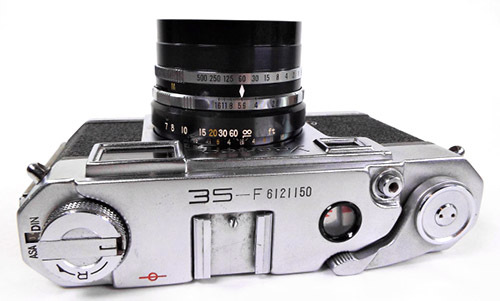 The same change occurred on the Yashica 35 in March 1960. 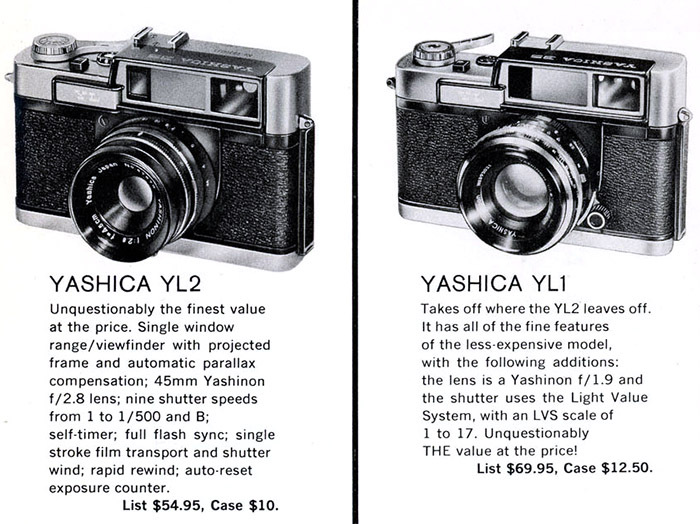 The extract from the US brochure below identifies two versions; the “Yashica YL2” and “Yashica YL1”, the former with f/2.8 lens and the latter with f/1.9 lens and Light Value (LV) scale marked on the front ring and a “coupling ring” (as described in the user manual) to enable moving the shutter and aperture together for any given LV. Although not strictly necessary, the LV scale is most useful when using an exposure meter that provides a reading in LV numbers. There are two versions, one with f/1.9 lens 4.5 cm Yashinon lens mounted in a Copal SVL shutter and the other with an f/2.8 Yashinon lens mounted in a Copal MXV shutter. Both versions are fitted with a self-timer. 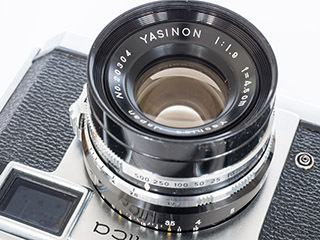 Japanese Wikipedia claims that the f/1.9 version was released first and featured the same construction lens as on its Yashica 35 predecessor (6 elements in 4 groups) and that the f/2.8 wasn't released until 1960, also featuring the first f/2.8 lens construction of 5 elements in 4 groups. 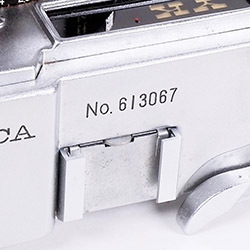 Note, to understand how the year codes work, refer to the Yashica 35 serial number table further above. The table tells us a number of things. First about the serial numbers. Production starting in March 1959 and ending in January 1960 seems to be in line with a release date of April or May, depending on source, and the January end date claimed by Alan R. Corey. 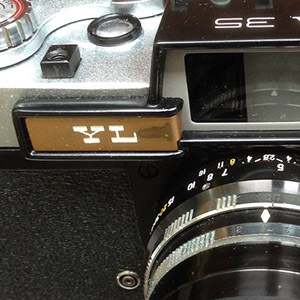 As with the Yashica 35, there are several cameras with serial numbers beginning with “5”. This seems to equate to 1959 but I can't explain how that works in terms of either Showa or the western calendar. 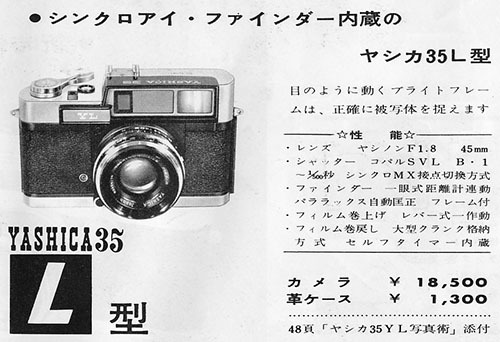 It may be that Yashica has really tricked us by omitting the “9” of “59” for 1959. 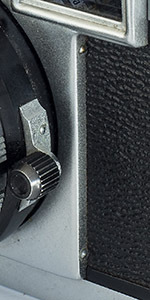 Although I have identified two trim changes in the table (there are also three versions of the focus assist lever, see further below for all trim variations), the way that there is a hard cut over from one type of shutter button to the other is consistent with my understanding of the serial numbers. The advertised f/2.8	(left) lens and f/1.9 (right) lens. The unexpected and unusual f/1.8 type A (left) lens and unexpected but more typical f/1.8 (right) lens. Without translation, it is clear the the lenses are f/1.8 in both documents. 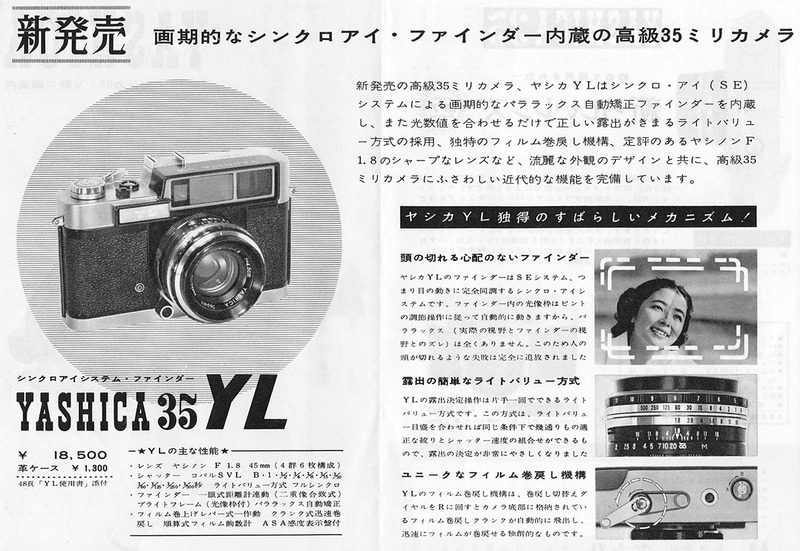 The reference to “Yashica 35 L” in the first scan would have only been understood by Yashica's marketing department but the cameras that we know as, and are marked as, YE, YK and YL are sometimes, in fact mostly, advertised in Japan without the “Y”. More here. 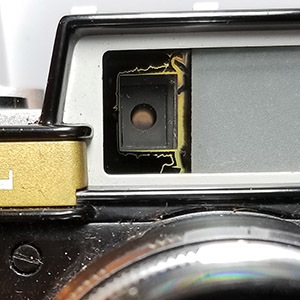 Another variation first noticed by Chris Whelan is that while most of the YL examples, including those in the f/2.8 and f/1.9 user manuals, have a diamond shaped mask in the rangefinder window, later cameras often (but not always) have a circular mask. 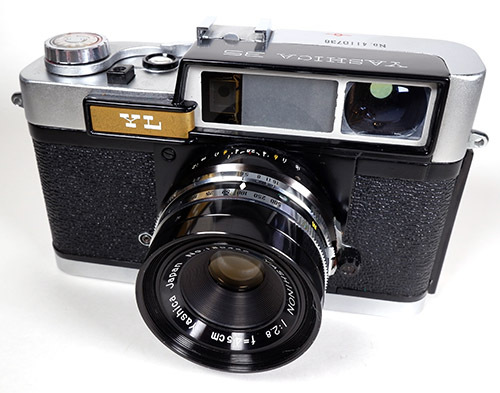 After the Yashica YK and YL came a whole slew of similar rangefinder models based on the YL body but with new flat top plate. 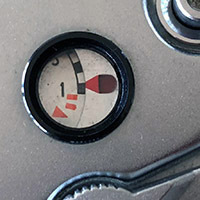 The base plate rewind crank was there for the first new model released in 1960, the “35 M”, later renamed “Minister”, but disappeared with the Minister II restyle which followed the modernised Lynx 1000 design cues. 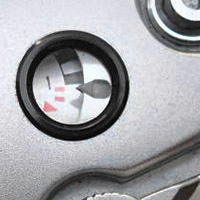 The mid-spec 35 M model featured a selenium cell exposure meter for the first time. 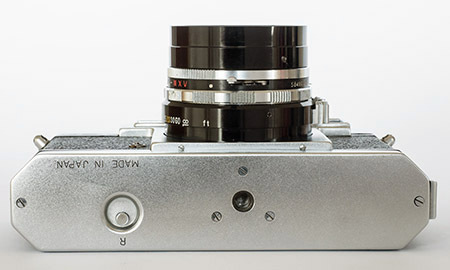 It was called the “35 M” inside the user manual, “Model M” on the cover and “Yashica M” on the front of the camera, presumably because “M” follows “L” as in “YL”, however, there is a claim that Leica was unhappy about that. In any case, it was renamed “Minister”. Minister II (1962), III (1963), and then D (1964) and 700 (1964) with CdS meters followed. Surprisingly, there was also an “M-II” with the model engraved on the front of top plate, otherwise it looks like a Minister II and the M-II user manual uses Minister II photos inside. The top-spec Lynx 1000 model (1960), which added a 1/1,000 shutter and standard f/1.8 lens, was followed by the Lynx 5000 (1964) with CdS meter and the famous, expensive and heavy Lynx 14 (1965) with f/1.4 lens (shutter reduced to 1/500). The last two were later updated to the 5000E and 14E respectively (1968). 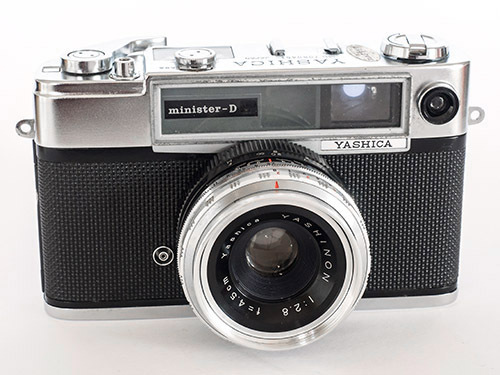 The lower spec Campus model (1962) was very similar to the Minister II but without the meter and the slightly earlier Yashica J and its 35W twin (1961) were similar to the Campus but with lower spec shutter. 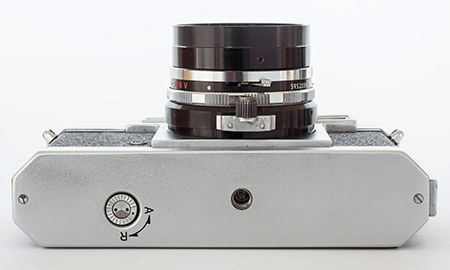 The Yashica EE offered selenium cell based exposure automation in 1962 followed by the Minimatic-C and Minimatic-S in 1963. Finally in 1966, the all new Electro 35 ushered in the electronic revolution and rangefinder success. 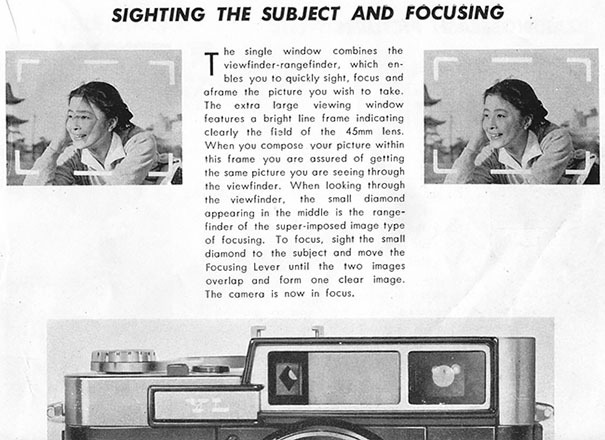 Perhaps forerunners to the Yashica EE, or simply aimed at a different market segment, the quite different Flash-O-Set (1961) and its successor, Flash-O-Set II (1962), were the only non-rangefinder types. Both are fitted with fixed focus 3 element f/4 Yashinon lenses and feature the single speed shutter, built-in bulb flash and very basic selenium cell based exposure automation used later on the Yashica E TLR, more here.